It is now October and we are so excited for this upcoming season! Our team cannot wait for classes to start and we are all counting down the days until we see all of your smiling faces back in our dance classes. October is also Occupational Therapist month and we would like to take this month to recognize and celebrate the amazing work that all of our OT’s do! All month long you can look forward to posts about each one of our OT’s explaining why they love the Dance Ability Movement and their job! The first OT we would like to thank is Mallory Ryan! 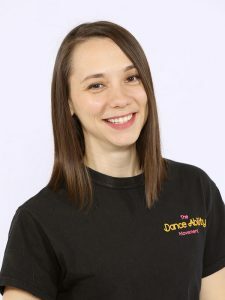 Mallory is not just an OT, she is also one of the creators of The Dance Ability Movement, and it is thanks to Mallory and her sister Jade that we have this wonderful program! Q: What was your first interaction / experience with The Dance Ability Movement? A: It started out as a dream…I vividly remember the excitement of registering our first dancer. Q: Why do you work for The Dance Ability Movement? A: I don’t think of my role with The Dance Ability Movement as work – it’s a part of who I am! I whole-heartedly believe that everyone deserves the chance to dance, and that dance is a powerful vehicle towards inclusion. I feel most fulfilled when I am working towards achieving my vision of an inclusive world where dance connects us all! Q: Share one highlight / memory / moment from a dance class that has impacted you or stuck with you! A: Parent Feedback. Volunteer growth. Dancers’ transformation. These three things move me at my core – they are also all connected. There are countless moments which propel me forward on this journey! Q: Share something you’ve learned from your experience with The Dance Ability Movement, it can be from our team, the volunteers, the dancers, families, etc. A: I’ve learned that authenticity is key. You do not need to try to impress anyone, you will be accepted when you are most yourself. Parents respect it, volunteers relate to it, and dancers teach us this every day. I’ve learned that we all want to belong, and belonging stems from wanting to be somewhere, where you’re also wanted. It seems simple – and it is – it all starts with kindness, acceptance – and dance! Q: Do you get stage fright? A: Yes! But being with a group is very helpful – we can all channel our excitement into positive energy! Q: What’s your favourite part of dance class? A: The little moments. The excitement of dancers waiting at the door to come in, greeting their friends. I love freestyle when I see connection between dancers and buddies. Q: Any credentials, training, area of expertise you want to share on our website? A: You can visit the “About Mallory and Jade” page for this 🙂 There are a few differences between Jade and I, but not many. Same education, same profession, many similar courses and experiences. We are passionate about all of the training and experiences that led us to becoming “Dancing OT’s” . I am most grateful for all I have learned from my sister, my family, and the many dancers, volunteers, and families we have been so fortunate to dance with! The value of these experiences cannot compare to any professional development, training, or credentials. 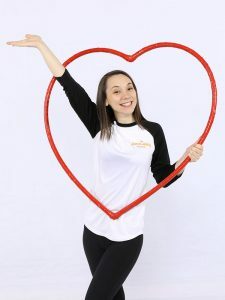 We appreciate the work you do as an OT and as a co-founder and our community of dancers, volunteers, parents and partners are continuously inspired by your passion and dedication. Thank you Mallory!